Arrange the shaped silicone cups on a baking pan, fill and bake, then decorate and serve. 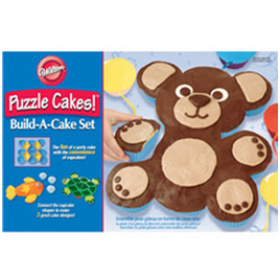 Decorating Puzzle Cakes!? is easy! Check the instructions inside for 3 fun designs you can create using simple icing techniques and colorful candies. Or, use your imagination and create more fun shapes of your own.